Lake Taal when are you coming to take a look? Lake Taal is the deepest lake in the Philippines, bet you didn't know that, well I didn't, apparently 172m. Taal Lake is about 70 km from Manila which will take you about 2 hours to get to, a very easy day trip from Manila. It is well known for what is in the middle of the lake, Taal Volcano. The spectacular view from the rim of the once proud volcano is nothing short of breathtaking. 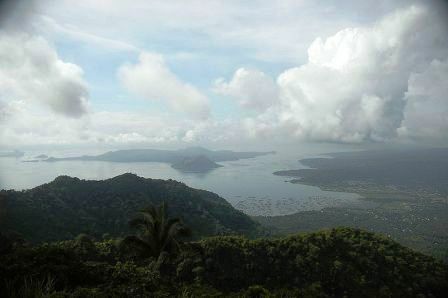 In the photo above you can see Taal Volcano and the view of Lake Taal. The fog and clouds can sometimes play havoc with your view, but either way you can see and enjoy the sheer enormity of Lake Taal. Lake Taal is alive and well, which is a good thing, the freshwater lake is home to many endemic species of fish, it is also home to one of the worlds rarest freshwater sea snakes. Like all sea snakes it is venomous, but rarely comes into contact with man. 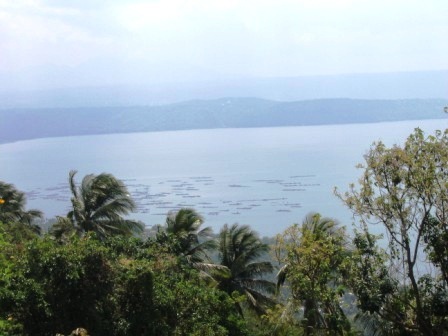 In the photo below you can see the Tilapia fish farms, or at least the grow out cages in Lake Taal. The fingerlings are farmed in what use to be old rice paddies prior to moving to these grow out cages. Apart from enjoying the magnificent view from the rim of the ranges and the best place to see the view is at Tagayatay, you do have the opportunity to take the banca trip to Taal Volcano and trek to its crater. Now some people have swam in Crater Lake, it is believed to have medicinal properties, but I'm not sure if that is for me and I love the water, any kind of water! Or you can visit Taal Lake Yacht Club where you can sail, row or use there kayaks, they even have overnight lodging facilities. Lake Taal is a day trip from Manila. If you are interested in a day trip fully organised, from Manila to Lake Taal and Taal Volcano then just complete the form below and someone will contact you with details of the tour and prices. The actual tour goes for about 10 hours and will pick you up and drop you back to your hotel in Manila. You travel in air-conditioned luxury, which is the only way to travel in the Philippines as the humidity is a killer! On the way to Lake Taal you stop off at the Bamboo Organ in Las Pinas, which is a 19th Century church organ made entirely from bamboo, you also stop and have a look at Saro Motors which is the Jeepney Factory.then it is on to Tagaytay and your first glimpse of the view over Taal Lake. Would you like to talk to someone about a day trip to Lake Taal and Volcano? Then click on the icon below for online live support. One click away from live help!